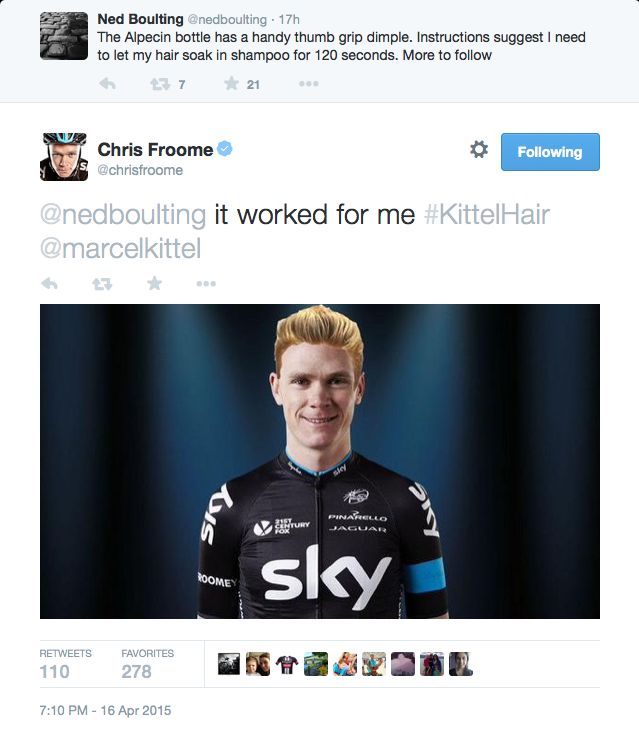 Cyclists and Twitter is often a fantastic combination, allowing the fans a behind the scenes look at what goes on in the professional peloton. Here are some of the tweets that caught our eye this week, including ones from Luke Rowe, Fabian Cancellara and Team Sky. 1. Jens Voigt live tweeted his way though an Aussie Rules game on a trip Down Under in a rather bizarre series of tweets. The sportsman’s diet has gone out the window, though. 2. Geraint Thomas finally opened the massive bottle of premium Belgian beer he won at E3 Harelbeke. Sharing it with the team, however, meant that nobody got very much of it. 4. I can safely say I’ve never had one of those unplanned 180km rides that Mark Cavendish did this week. Did one of those unplanned, go exploring kind of rides today. Discovered some beautiful new Tuscan climbs. 180km later & I'm finally home. 5. Russell Hampton listened in on a bit of Tory policy making. 6. Alex Dowsett’s certificate for a blistering 10-mile TT time finally came through, with the Movistar rider hoping to recapture that form, for longer, in his Hour Record attempt on May 2. 7. Even a professional cyclist like Fabian Cancellara can’t afford to fork out 18,000 notes on a bottle of 15-year-old wine. 8. In a slightly lower class establishment than Cancellara’s, Jack Pullar and Ian Bibby tuck into a proper lunch. 9. NuunSigmaSport’s Wouter Sybrandy beat Paris-Roubaix winner John Degenkolb once, five years ago, apparently. 10. And finally, the tears flowed around the cycling world for Bradley Wiggins’s departure from Team Sky, and the British team gave him an excellent Twitter send off.